As amateur translators of subtitles, fansubbers are non-professional subtitlers. They are fans and their work in subtitling translation is done for other fans. For that reason, they often end up becoming quite large virtual communities. 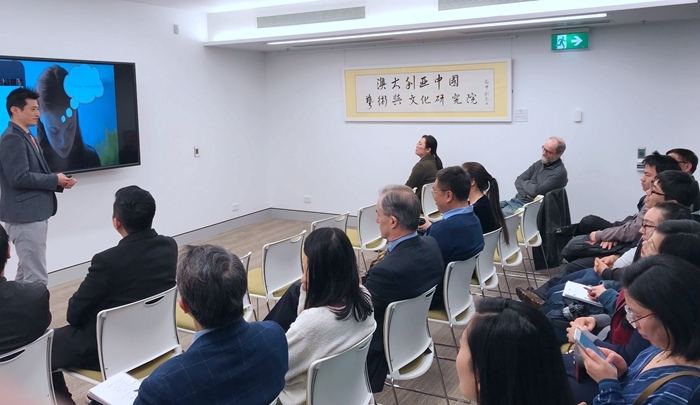 On 17 August, 2018, Dr Dingkun Wang visited ACIAC and did a seminar talk on the work of such communities in China. Dr Dingkun Wang is a postdoctoral research fellow at the Jiao Tong Baker Centre for Translation and Intercultural Studies of Shanghai Jiao Tong University. He had his PhD in Translation Studies from the Australian National University in 2015. He is the associate editor for the upcoming special issue of Perspectives, ‘Mapping Contemporary Audiovisual Translation in East Asia’, in collaboration with Xiaochun Zhang from the University of Bristol (U.K.) and Arista Szu-yu Kuo from the Nanyang Technological University (Singapore). His ongoing research looks into the informal knowledge and information audiovisually encoded in the quantum archives of networked digital media. In his talk, Dr Wang began with a brief retrospective look into the beginnings of Chinese online fansubbing activities in the early part of the century through major websites like YYeTs, YDY, 1000fr, and Shengcheng. He then traced the sporadic trajectory of the developments of some of these fansubbing entities, highlighting their tactics for survival under regulation and informal features of their translation. Dr Wang spoke about the incredible expertise that Chinese fansubbers from various walks of life mobilized for the translation of highly technical language in foreign movies. He also spoke of the ethical and legal issues involved in the carnivalesque mass voluntary participation in the work. 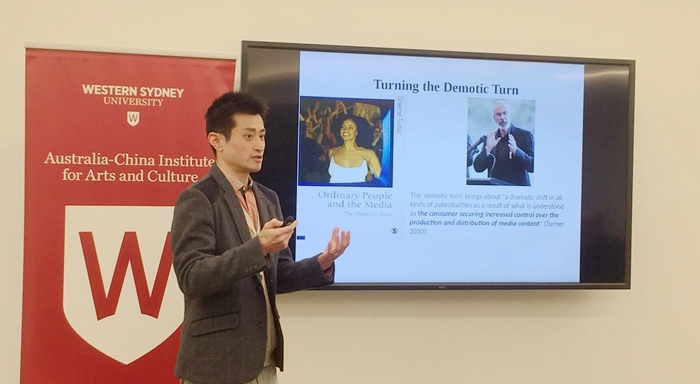 Dr Wang cited numerous examples of the Chinese fansubbers’ recent work and pointed to a deliberate intention on the part of the fansubbers to resist traditional aesthetic standards and the control of ideological orthodoxy in their work. He concluded that these informal audiovisual translation networks in China contributed to a formation of new popular cultures in the country that are characterized by the creation of temporary autonomous zones of renegotiated audience, gamification and techno-utopia and resistance. After his talk, Dr Wang and the inspired audience threw themselves into a heated session of Q&A about formal/informal translation, copyright issues, voluntary work, mass creativity and censorship. 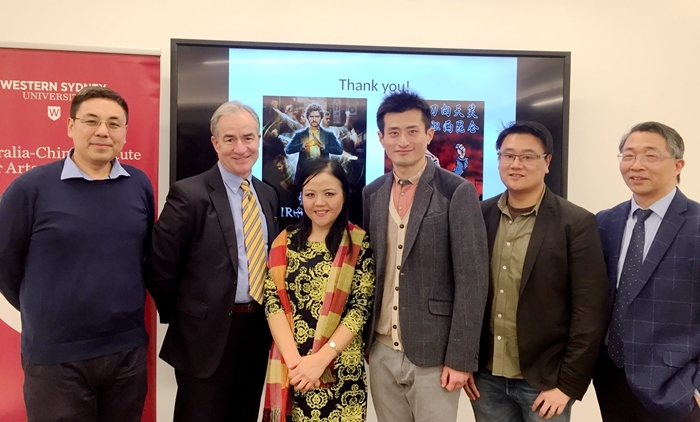 At the talk were Dean of SHCA, Professor Peter Hutchings, eminent subtitler Dr Jing Han, Dr Lan Zhang from Macquarie University, Chinese artist Mr Hongjun Zhang, former celebrated SBS journalist Mr Jianguo Li. Dr Kiu-wai Chu moderated the event.